I finally experienced the Japanese and Latin culinary fusion while back in Chicago. It's not a pairing that leaps to mind, but apparently it's quite popular in Chicago. 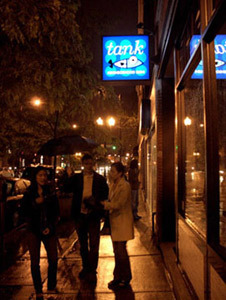 First, Joannie, Mike, and I hit Tank Sushi, a fairly new and trendy sushi joint near their condo in Lincoln Square. The menu features traditional Japanese and Latin American favorites like sushi and ceviche, but in areas like sushi rolls it brings ingredients from both regions together in unexpected combinations: escolar and jalapeno, yellowtail and mango. The fish was fresh, but why the pulsing techno music? Or do Japanese and Latin American music not mix? Later in my visit, my first business manager Ted and I held a lunchtime reunion at Sushi Samba, a restaurant which is more precise about its lineage: Japanese, Brazilian, and Peruvian. South American beef maki rolls? They call the U.S. a melting pot, though I don't think it was meant literally. This whole movement hasn't made its way to Seattle, yet, though the sheer number of possible combinations of cuisines is mind boggling.